Until I was in my mid-teens, I lived in Fantasy and largely ignored Science Fiction. Seeds of Earth by Michael Cobley is a perfect example of the reasons why I began to pay attention. Book one of the Humanity’s Fire trilogy, Seeds of the Earth is set some years after humanity was forced to flee from Earth by alien warfare. Three ships of humans were sent out from Earth, one of which landed on Darien after the AI on their ship rebelled against them. Isolated, without knowledge of the fate of Earth or the other two ships, they live alongside the native alien population of Darien, the Uvuvo, with their strange beliefs in the power of nature and the spirit of their planet. Over a century passes before they are contacted by the outside world. The message? Earth is out there still, and things have become political. As a devastating war threatens to erupt across the galaxy, the inhabitants of Darien find themselves in the centre of it, their people and their planet riddled with deadly secrets. This book is a brilliant space opera, but the imaginative force behind it is stunning and heartfelt. The author’s environmental concerns are clear throughout and thinly veiled, but to me, of course, that is only a plus! What’s more, the further I got through the book, the the more I came to appreciate this setting, as the environmental messages weave into the main conflict, which centres around the differences between the natural and the mechanical. 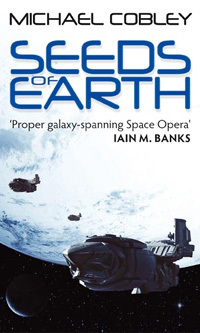 Seeds of Earth was published in the UK by Orbit in 2010. It is available in from many excellent book retailers in Paperback for £7.99.